Designation: Cardio- Thoracic Department, Azienda Ospedaliero-Universitaria Pisana. List of Author(s): Roberta Antonazzo Panico, Marco Angelillis, Lorenzo Bertini, Cristina Giannini, Marco De Carlo, Anna Sonia Petronio. Copyright: © 2018 Panico RA, et al. This is an openaccess article distributed under the terms of the Creative Commons Attribution License, which permits unrestricted use, distribution, and reproduction in any medium, provided the original author and source are credited. We describe the case of an inferior MI following blunt chest trauma. A 46-year-old male without any relevant medical history was transported to the emergency room after a car accident. First diagnostic tests showed multiple rib fractures with bilateral pneumothorax (PNX) and pulmonary contusion. Cardiac contusion was suspected due to a mild increase of myocardial cytonecrosis markers without alteration of electrocardiogram (ECG) and echocardiogram. So, the patient was discharged two weeks later when PNX was resolved. After few days he was readmitted to the hospital complaining chest pain and palpitations; ECG revealed inferior q waves. Echocardiography and cardiac MRI confirmed a recent inferior MI. He was submitted to coronary angiography which showed a dissection of the right coronary artery in the proximal segment. Interestingly, angiography showed an anomalous high origin of the vessel above the sinotubular junction. A drug-eluting stent was implanted with a good final angiographic result. The patient was discharged after two days. One month later he was asymptomatic. Cardiac contusion is not uncommon; however acute MI is a rare complication of blunt chest trauma. Careful clinical suspicion can lead to optimal medical care. However, best treatment of these uncommon case remains debated. Myocardial infarction, Coronary artery dissection, Blunt chest trauma. Chest trauma is a clinical condition with a high reported mortality. Myocardial infarction (MI) secondary to coronary dissection following blunt chest trauma is a very rare entity. Differential diagnosis includes an isolated cardiac contusion, aortic dissection or rupture and pulmonary embolism. In clinical practice, it can be challenging to discriminate between cardiac contusion and MI after chest trauma. The latter usually occurs in previously diseased coronary vessels as the consequence of plaque rupture or erosion due to blunt chest trauma. Other cause of MI after blunt chest trauma is coronary dissection that usually occurs immediately after trauma. Our case report shows as coronary dissection can occurs after some days from chest trauma and how cardiac imaging, such as magnetic resonance imaging (MRI) and coronary angiography, are crucial in the diagnosis and treatment of MI following chest trauma. We describe the case of a 46-year-old man admitted to the emergency room following a car accident. First physical examination and non-invasive exams revealed a poly-trauma with multiple fractures involving the left wrist, pelvis, limbs, rib fractures, bilateral pneumothorax and pulmonary contusion. The patient was transferred to the intensive care unit. Laboratory test showed increased high-sensitive (HS) troponin values. Diagnosis of cardiac contusion was then supposed. Moreover, no significant changes in ECG and/or any wall motion anomalies at echocardiography coexisted. Pneumothorax was resolved without chest tube placement and after two weeks the patient was discharged asymptomatic with normalization of cardiac enzyme values. Few days later, he returned to the hospital for chest pain at rest and palpitations. ECG showed sinus rhythm with q waves on inferior leads (Figure 1). Cardiac enzyme values were normal. Echocardiography showed akinesia of proximal inferior and proximal infero-septal wall. Cardiac MRI confirmed wall motion abnormalities and consensual myocardial oedema with transmural delay-enhancement. Oedema was detected also on basal segment of right ventricular free wall. Global cardiac function was normal. Minimal pericardial effusion, mainly localized at the right ventricular apex, was also present. ECG shows q waves on inferior leads. Figure 1: ECG shows q waves on inferior leads. Subsequently, the patient was referred to our catheterization laboratory for coronary angiography, that revealed a non-flow limiting dissection in the proximal segment of right coronary artery (Figure 2a-2b). Interestingly, origin of right coronary artery was not from the sinus of Valsalva, as usually, but from the anterior aortic wall above the sino-tubular junction, with a very stretched proximal tract of the vessel. We performed also an aortography in order to exclude a concomitant aortic dissection. Coronary dissection was treated with a drugeluting stent implantation (3.5/18 mm) with optimal angiographic result (Figure 2c). Dual antiplatelet therapy with low-dose Aspirin and Ticagrelor was administered immediately. Patient was discharged asymptomatic two days later. At one-month clinical follow-up, the patient was asymptomatic. Coronary angiogram reveals dissection of proximal right coronary artery in left and right angiographic projections. Figure 2A-2B: Coronary angiogram reveals dissection of proximal right coronary artery in left and right angiographic projections. Coronary angiogram after stent implantation, with intimal flap completely covered. 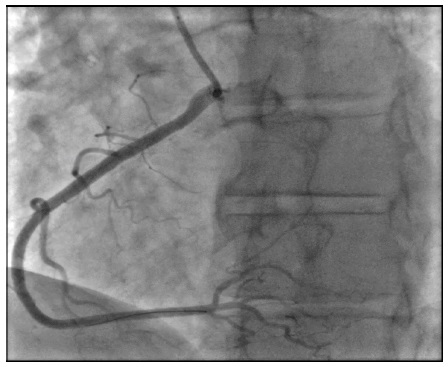 Figure 2C: Coronary angiogram after stent implantation, with intimal flap completely covered. Our case seems to be a very rare case because of its etiopathogenesis and some particular anatomical details. Firstly, acute MI is a rare complication of blunt chest trauma and may be the consequence of multiple mechanisms such as heart rupture, cardiac contusion or haemorrhages, coronary occlusion (3%) with intraluminal thrombus formation. The latter more frequently occurs on a pre-existing atherosclerotic plaque, or a “de novo coronary stenosis” caused by external compression or sub intimal oedema, coronary dissection due to intimal tear or coronary spasm [1-3]. Secondly, traumatic coronary artery dissection usually affects the LAD with a small percentage involving the left main (overall 76%), followed by the right (19%) and the circumflex coronary artery (5%). Higher incidence of LAD involvement can be related to its proximity to the chest wall . Particularly, in our patient the atypical origin of right coronary artery and its stretched path of the proximal tract probably favoured the dissection. Blunt traumatic dissection occurred in this case in a non-pathological vessel (free of atherosclerotic burden) in contrast with the phenomenon usually involving a previously diseased coronary artery segment [4,5]. Other interesting aspect in our case is the time onset of MI. Previous reported case [3,6] showed as coronary dissection occurs immediately after the trauma. Otherwise, this patient showed a considerable delay (more than 7 days) between chest trauma with probable cardiac contusion (HS-troponins mildly increased with normal ECG and echocardiography), and coronary artery dissection (pathological ECG and echocardiography findings), as reported in other literature cases [5-7]. Prompt reperfusion of an infarct-related artery is a key strategy in STEMI care. Primary PCI seems to be the best reperfusion strategy. Thrombolytic therapy has also been reported, however its use in polytrauma patients could be harmful , considering that in case of severe chest trauma victims have multiple injuries, particularly rib or sternal fractures, hemothorax, and lung injury . Furthermore, up to 50% of the individuals have brain injury, which is generally considered to be an absolute contraindication to fibrinolytic therapy [4,8]. Dual antiplatelet therapy is strongly recommended. In our patient the vessel had already been spontaneously re-perfused with optimal distal flow (TIMI 3). Therefore, indication to stent implantation was recommended by the presence of a potentially harmful coronary dissection and by patient symptoms (chest pain, palpitations). Most individuals recover from chest trauma without any long-term sequelae [4,5]. However, late complications may develop months or even years after cardiac trauma, including atrio-ventricular conduction disturbances, acquired coronary artery fistulae, pericardial effusion and constrictive pericarditis. Our patient already presented minimal pericardial effusion on right ventricular apex probably due to the myocardial contusion as detected by MRI. Therefore, it is recommended that patients with documented cardiac injury should be re-evaluated within 3 to 6 months after trauma . Differential diagnosis commonly includes myocardial contusion, aortic dissection or rupture and pulmonary embolism. Pulmonary embolism usually occurs with a certain degree of delay due to the patient immobilization. In our case instrumental findings (ECG, cardiac ultrasound and MRI) straight oriented the diagnosis for myocardial infarction, excluding other possibilities. In conclusion, MI related to thoracic trauma is a severe complication that must always be considered, in presence of an indicative clinical condition (chest pain and/or dyspnoea) associated with increased myocardial enzyme levels and pathological imaging findings.